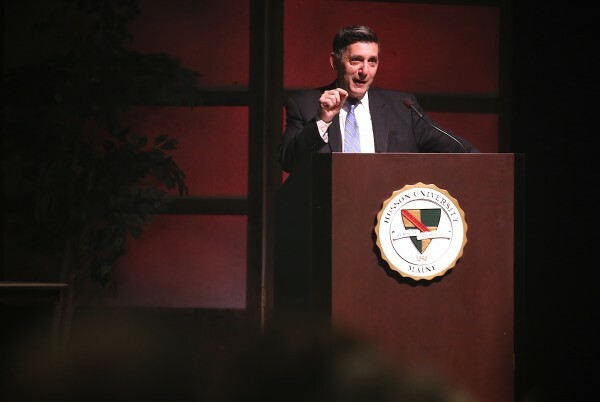 Michael Botticelli, the top U.S. drug policy official, spoke during a on Wednesday evening event at Husson University in Bangor. 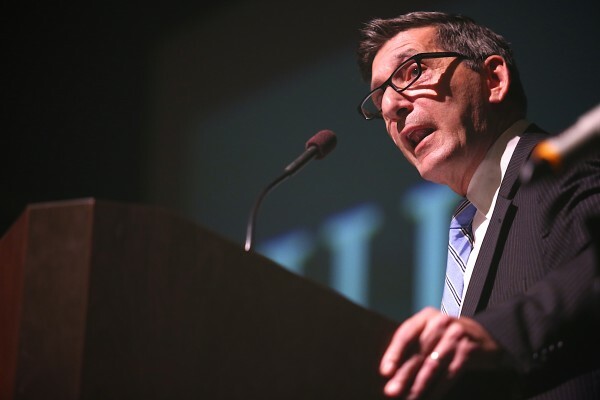 Michael Botticelli, the top U.S. drug policy official, spoke during an event Wednesday evening at Husson University in Bangor. BANGOR, Maine — The top U.S. drug policy official said Wednesday that the federal government has awarded $7.5 million to help 19 Maine community coalitions fight substance abuse. During his Bangor visit, Botticelli officially announced 680 Drug-Free Communities Support Program grants, totaling $84 million, to communities across the country, 19 of which are in Maine, according to the White House. “We can’t arrest and incarcerate our way out of this problem,” Botticelli told the crowd. That approach has been tried for decades, he said, but the results have been high recidivism rates and crippling expenses for courts and jails across the nation. Treatment and support is the answer but is dramatically hindered by the stigma surrounding addiction. The perception that those suffering from addiction just refuse to “quit” — ignoring the fact that addiction is a disease — is harmful and prevents people from seeking opportunities to recover, Botticelli argued. Only about 19 percent of people suffering from addiction seek out help and treatment, Botticelli said. Community support and police and court referrals those individuals to treatment resources are key in reversing that. A key toward reining in prescription drug abuse is educating the prescribers, Botticelli said, citing the statistic that 82 opioid prescriptions are issued in Maine for every 100 people. “We just don’t have that much pain,” Botticelli said. To counter that, the Office of National Drug Control Policy has been pushing to educate prescribers and urging states to use databases as a way of tracking patients that might be “doctor shopping” to get prescriptions filled. Botticelli was invited to participate in the event by Bangor City Council Chairman Ben Sprague, who sent a letter to the White House in June. In the invitation, Sprague cites a study that found in 2010, substance abuse cost Maine an estimated $1.43 billion — a 56 percent increase from just five years earlier. The cost was $160 million in 2010 in Penobscot County alone. In spite of those vast expenses, just 3.5 percent of the money spent dealing with addiction-related issues in Maine goes toward treatment and prevention, according to Bruce Campbell, chairman of the Bangor Region Public Health Advisory Task Force. The result is staggeringly high costs of dealing with addiction after it’s become an embedded, repetitious problem. Public health agencies in Bangor, Portland, Machias, Caribou, Bar Harbor, Waterville, Westbrook and Lewiston are listed among the grant recipients. Some are in the midst of multi-year grants. For the full list, visit www.whitehouse.gov/ondcp/Drug-Free-Communities-Support-Program. The grant money can only be used to fund community coalitions that have formed to address substance abuse among youths. In Bangor’s case, the funding will be granted to the Bangor Public Health Advisory Board’s Substance Abuse Prevention Task Force. The White House Office of National Drug Control Policy advises the president on drug-control issues and coordinates drug-control activities across federal government agencies. Follow Nick McCrea on Twitter @nmccrea213. Correction: An earlier version of this story misidentified what the DFC funding could be used for. DFC funding can only be used to fund community coalitions that have formed to address youth substance use.